Those humans! They come is so handy sometimes. Especially when waitstaff cant afford either living in the city or the commute. The forces making this one of the most expensive cities in America are altering the economics of everything. Commercial rents have gone up. Labor costs have soared. And restaurant workers, many of them priced out by the expense of housing, have been moving away. Restaurateurs can no longer find or afford servers. And so in this city of staggering wealth, you can eat like a gourmand, with real stemware and ceramic plates. But first you’ll have to go get your own silverware. Souvla, a Greek restaurant with a devoted following, serves spit-fired meat two ways: in a photogenic sandwich, or on a photogenic salad, either available with a glass of Greek wine. The garnishes are thoughtful: pea shoots, harissa-spiked yogurt, mizithra cheese. Runners will bring your order to the table, but there are no servers to wait on you here, or at the two other San Francisco locations that Souvla has added — or, increasingly, at other popular restaurants that have opened in the last two years: RT Rotisserie, which is roasting cauliflower a few blocks away; Barzotto, a bistro serving hand-rolled pasta in the Mission district; and Media Noche, a Cuban sandwich spot with eye-catching custom tilework. Inside these restaurants, it’s evident that the forces making this one of the most expensive cities in America are subtly altering the economics of everything. Commercial rents have gone up. Labor costs have soared. And restaurant workers, many of them priced out by the expense of housing, have been moving away. Restaurateurs who say they can no longer find or afford servers are figuring out how to do without them. And so in this city of staggering wealth, you can eat like a gourmand, with real stemware and ceramic plates. But first you’ll have to go get your own silverware. 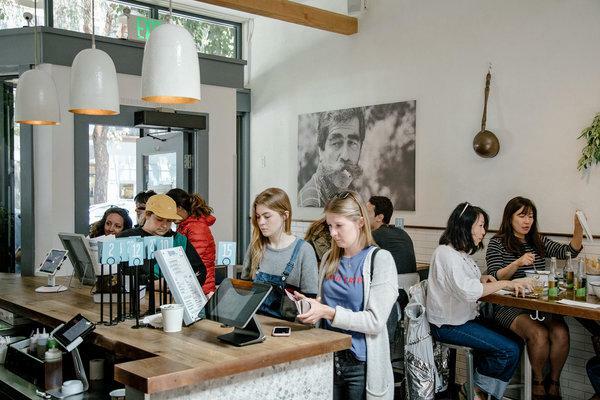 Restaurateurs here have taken a model familiar to taquerias and fast-casual, cafeteria-style places like Sweetgreen and Chipotle Mexican Grill, and pushed it further up the fine-dining food chain. Call it fast-fine, they suggest, or fine-casual. Or counter service “in a full service environment” that includes $11 cocktails and $22 pan-roasted salmon. fit what analysts say is growing demand for more flexible dining options. But here, the extreme economics have rapidly made the model commonplace. San Francisco’s tech riches have fed demand for restaurants — and some wealthy tech workers have decided they would also like to be partners in a restaurant, opening up more investment. But as those highly paid workers have also driven demand for scarce housing, the city has struggled to keep lower-wage workers afloat. Charles Bililies had worked in fine-dining restaurants for years before he opened the first Souvla in 2014. By then, restaurateurs were already fretting about the city’s employer mandates and housing costs. At Souvla, there is no oversize menu board above the counter, no service line where your food is assembled before your eyes. Behind the counter sits a shelf of wine glasses for the all-Greek wine list, touches that make the place feel plausible for a dinner date. At the original Souvla, the counter is just inside the front door, so a line invariably spills onto the sidewalk, a neat marketing trick that also means the restaurant wastes little of its rented space on waiting customers. a full-service restaurant could manage in the same space. For restaurateurs, counter service makes fine dining — or something like it — profitable. To economists, it makes sense. David Neumark, a professor at the University of California, Irvine, who has studied the minimum wage, recalled a trip to Norway where nearly every restaurant he and his wife visited relied on counter service. “I said, ‘Well, duh,’ ” Mr. Neumark said. “It was so clear there.” Norway has among the highest median wages in the world. So parts of this story are not new. “Economic history is filled with ways that we have figured out how to do things with fewer workers, and ultimately that’s what makes us richer,” he said. Innovations in farming machinery or microwave meals, for instance, freed up people to be more productive, and better paid. But that is not entirely what is happening here. Restaurants haven’t developed a way to serve meals with less labor. They’ve gotten customers to do the labor they had been paying employees to do. There is something innovative in reprogramming diners to decouple fine food from full service. But the fact that restaurants have to do this speaks to deep fears here of what the Bay Area will look like if certain classes of workers can’t afford to live here.“It’s really sad,” said Jennifer Sullivan, who worked for years as a server in the area. Twenty years ago, she moved from Chicago to Oakland, where she rented a $750 studio apartment and waitressed her way through college. She fears that story would not be possible in the Bay Area now. “I’ve even had dystopian future visions of buses full of labor that come from the outskirts of these really wealthy areas,” she said. A few blocks from the original Souvla, at the celebrated modern French restaurant Jardinière, the chef Traci Des Jardins said her labor costs, including taxes and health care, now eat up 43 percent of her budget. second glass of wine, or ordering two appetizers instead of an entree. At one of her other restaurants in town, she now serves lunch as counter service. The strategy, in other words, is to go to precisely the places with rotten economics.